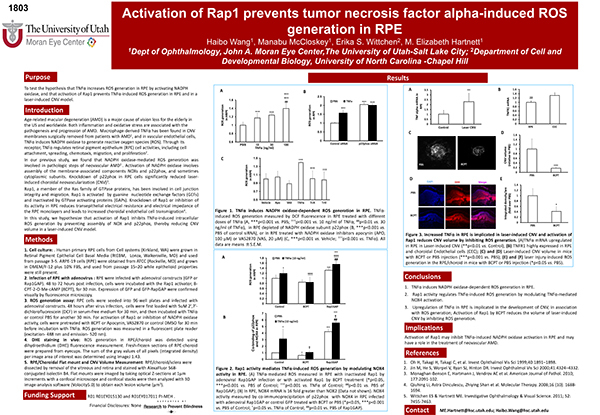 Purpose: To test the hypothesis that TNFα increases ROS generation in RPE by activating NADPH oxidase, and that activation of Rap1 prevents TNFα-induced ROS generation in RPE and in a laser-induced CNV model. Introduction: Age-related macular degeneration (AMD) is a major cause of vision loss for the elderly in the US and worldwide. Both inflammation and oxidative stress are associated with the pathogenesis and progression of AMD. Macrophage-derived TNFα has been found in CNV membranes surgically removed from patients with AMD1, and in vascular endothelial cells, TNFα induces NADPH oxidase to generate reactive oxygen species (ROS). Through its receptor, TNFα regulates retinal pigment epithelium (RPE) cell activities, including cell attachment, spreading, chemotaxis, migration, and proliferation2. In our previous study, we found that NADPH oxidase-mediated ROS generation was involved in pathologic steps of neovascular AMD2 . Activation of NADPH oxidase involves assembly of the membrane-associated components NOXs and p22phox, and sometimes cytoplasmic subunits. Knockdown of p22phox in RPE cells significantly reduced laser- induced choroidal neovascularization (CNV)3. Rap1, a member of the Ras family of GTPase proteins, has been involved in cell junction integrity and migration. Rap1 is activated by guanine nucleotide exchange factors (GEFs) and inactivated by GTPase activating proteins (GAPs). Knockdown of Rap1 or inhibition of its activity in RPE reduces transepithelial electrical resistance and electrical impedance of the RPE monolayers and leads to increased choroidal endothelial cell transmigration4. In this study, we hypothesize that activation of Rap1 inhibits TNFα-induced intracellular ROS generation by preventing assembly of NOX and p22phox, thereby reducing CNV volume in a laser-induced CNV model. 1. Cell culture: . Human primary RPE cells from Cell systems (Kirkland, WA) were grown in Retinal Pigment Epithelial Cell Basal Media (RtEBM, Lonza, Walkersville, MD) and used from passage 3-5. ARPE-19 cells (RPE) were obtained from ATCC (Rockville, MD) and grown in DMEM/F-12 plus 10% FBS, and used from passage 15–20 while epithelioid properties were still present. 2. Infection of RPE with adenovirus : RPE were infected with adenoviral constructs (GFP or Rap1GAP). 48 to 72 hours post infection, cells were incubated with the Rap1 activator, 8- CPT-2-O-Me-cAMP (8CPT), for 30 min. Expression of GFP and GFP-RapGAP were confirmed visually by fluorescence microscopy. 3. ROS generation assay: RPE cells were seeded into 96-well plates and infected with adenoviral constructs. 48 hours after virus infection, cells were first loaded with 5uM 2′,7′- dichlorofluorescein (DCF) in serum-free medium for 30 min, and then incubated with TNFα or control PBS for another 30 min. For activation of Rap1 or inhibition of NADPH oxidase activity, cells were pretreated with 8CPT or Apocynin, VAS2870 or control DMSO for 30 min before incubation with TNFα. ROS generation was measured in a fluorescent plate reader (excitation- 488 nm and emission- 520 nm). 4. DHE staining in vivo: ROS generation in RPE/choroid was detected using dihydroethidium (DHE) fluorescence measurement. Fresh-frozen sections of RPE-choroid were prepared from eyecups. The sum of the gray values of all pixels (integrated density) per image area of interest was determined using ImageJ 1.43. 5. RPE/Choroidal Flat mount and CNV Volume Measurement: RPE/choroid/sclera were dissected by removal of the vitreous and retina and stained with AlexaFluor 568- conjugated isolectin B4. Flat mounts were imaged by taking optical Z-sections at 1μm increments with a confocal microscope and confocal stacks were then analyzed with 3D image-analysis software (Volocity5.0) to obtain each lesion volume (μm3). TNFα induces NADPH oxidase-dependent ROS generation in RPE. Rap1 activity regulates TNFα-induced ROS generation by modulating TNFα-mediated NOX4 activation. Upregulation of TNFα in RPE is implicated in the development of CNV, in association with ROS generation; Activation of Rap1 by 8CPT reduces the volume of laser-induced CNV by inhibiting ROS generation.